(SBA) and the voice of small business in President Obama’s Cabinet, Maria Contreras-Sweet, will join the Google Small Business Community for a Hangout on Air to share tips and insights for small businesses. Since being appointed by President Obama, Administrator Contreras-Sweet has made a priority to meet and hear from small businesses. On Wednesday, she will answer questions directly from small businesses through Hangouts. Over the past two weeks, thousands of small business owners from all over the US, representing various backgrounds, experiences, and businesses, have submitted questions for the Administrator covering funding for businesses to technology. Five small business participants will be joining the Hangout on camera along with the Administrator. One of the attendees, Brantley Crowder, is the director of e-commerce for Savannah Bee Company. Savannah Bee Company started in 2002 with a single beehive and a mission to support regional beekeepers by selling their honey and making honey-related health and beauty products. They started delving into digital with their website which launched in 2010 to support their stores in Charleston and Savannah. 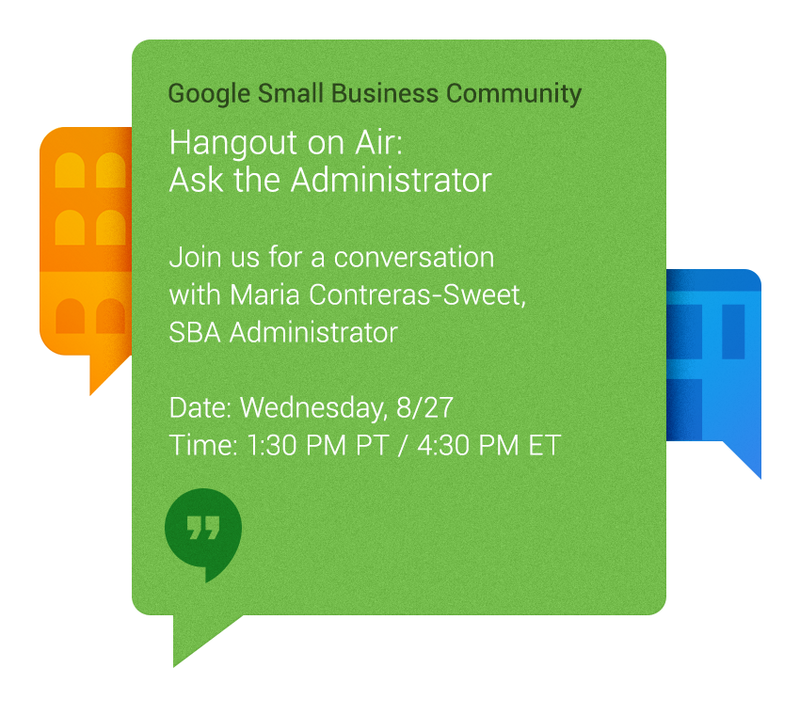 Join the SBA Administrator tomorrow at 1:30 PM PT / 4:30 PM ET in the Google Small Business Community, a public community, which gives business people direct access to experts and industry leaders like Contreras-Sweet. The event will also be accessible live on the Google+ Your Business YouTube channel, in the event invitation, and the SBA website, and the video will be posted for viewing post-event. RSVP to view the broadcast and submit your questions for a chance to have them answered live, on-air during the Hangout. There are 28 million small businesses in the US, and small businesses represent almost half of US private-sector jobs. What kind of support and resources does our government provide to make sure these small businesses thrive? Where can we find tips on how to start or grow a business? What funding opportunities are there? On Wednesday, August 27th, the leader of the U.S. Small Business Administration (SBA) and the voice of small business in President Obama’s Cabinet, Maria Contreras-Sweet, will join the Google Small Business Community for a Hangout on Air to share tips and insights for small businesses.